Contact us for a no-cost, no-obligation, no-pressure consultation. to ever receive the AAFD Chairman’s Award. 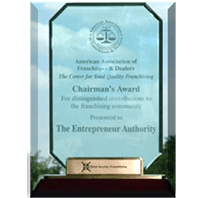 We are the only Franchise Broker network to ever receive the AAFD Chairman’s Award.